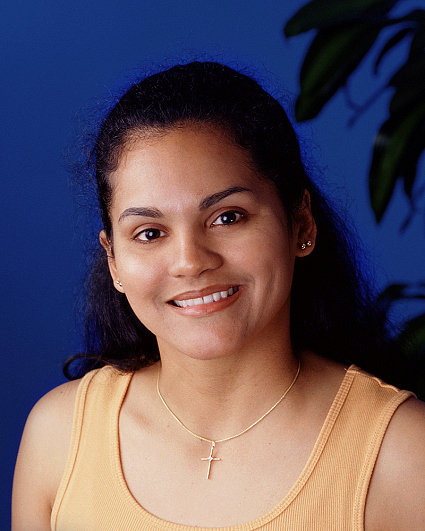 Born in Stamford, Connecticut, Sandra Diaz-Twine currently lives in Ft. Lewis, Washington with her husband, Marcus, and their two children, Tatiana, 8, and Alanna, 6. She is employed as a senior office associate with the Army and Air force Exchange Service. Prior to her current employment, she served as a chemical repair specialist with the United States Army. She also previously worked in the mailroom of the Army and Air Force Exchange Service and in customer service at a clothing store. Her favorite hobbies are fishing and camping. She describes herself as adventurous, dedicated and a team player. She is most proud of having graduated from community college where she received an Associates Degree in Business Administration from Fayetteville Community College in North Carolina. Her favorite sport is volleyball. Her mother is her hero because she has always been committed to and made sacrifices for her children. She thinks her mother is the bravest, kindest, most loving person and an inspiration. She believes she's a contender for SURVIVOR: PEARL ISLANDS because of her ability to improvise and feels her small knowledge of hunting will be an asset to the tribe. She also thinks she's a good provider and possesses good field skills. Her birth date is July 30, 1974.